The History of Penta Prism SLR. 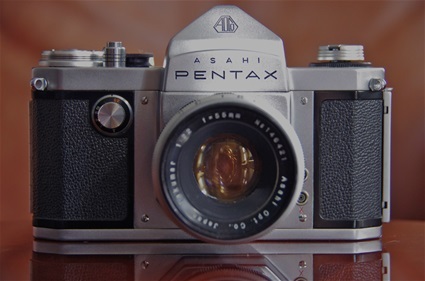 Asahi Pentax, the original from 1957. -Pentaprism SLR: origin and early history to the beginning of the digital era. -The Pentax PP SLR history. Pentaprism SLR (PP SLR) is to be understood as single lens eye level pentaprism mirror reflex camera made for 135-size film. Included are also the penta mirror cameras, a simpler version of the pentaprism. -In the first part of the chapter of the PP SLR history, I present the very beginning of this history by going through the timeline of the first cameras, thus showing who was first. This chapter is called The Origin. After that I aim at presenting the first model of every brand that produced a PP SLR during the first years, from late 1948 through 1959. Some of the cameras presented are very first models, some are among the first. In that case I try to explain the possible differences from the first edition. I do so to give you a better understanding of the variety of cameras. Presenting only first editions would have left too many holes in the story as they are sometimes almost impossible to get and/or extremely expensive. From the 60s to the digital takeover, I present models that are of importance to the history, decade by decade. This part is of course very subjective as it is my story. -The Pentax collection, which is the base of the collection and giving name to the site, consists of all 61 international film PP SLR models plus most local variants and some special models. This is very close to a complete collection. From digital takeover, only main models are presented. -Takumar lenses are presented in four chapters Takumar, Auto-Takumar, Super-Takumar and SMC (Super-Multi-Coated) Takumar. The lost brands are presented decade by decade, according to the year they produced their last PP SLR. All brands are also given a page of their own. The time zone given is for years of PP SLR production, from the first to the last. It is not the life span of the producer. The company usually is older and may have lived longer, but producing other cameras or other products. For instance, Minolta was founded in 1928 and is still operating as a company, but the production of penta prism slr cameras started in 1958 and ceased in 2006. Unless otherwise stated, all cameras and lenses shown are of my collection. Please note that this collection is not about mint or never used objects. Some are heavily used, but may have contributed to wonderful photos, while others are almost like new. Hopefully, both categories will show the beauty of older craftsmanship. Pictures are high resolution but come up reduced. To get a sharper version, just click them. Different machines will show different colour tones due to well known screen calibration problems. Pages are preliminary and are constantly being developed. The information given here is collected from books, magazines and from the internet, and may be disputable. On the question of which PP SLR was the first, there is obviously a lot of misunderstanding around. The "fact" that Contax S was first and Rectaflex right behind on second place can be read everywhere. You can read a hundred pages or more all repeating this. So, it ends up on Wikipedia and Camerapedia as The Truth. However, when reading first hand information from photo historians in Dresden, Germany, where the Contaxes where produced, and holding it against the Italian sources with very detailed information, it becomes clear that the "Wikipedia Truth" is false! From what I have found after some studies, truth is that those claiming the Italian Rectaflex as being first are right! And by a very clear margin. Read more in chapter PP SLR 1948-1954, in chapter 1949-1962: Contax, in chapter 1948-1955: Rectaflex, and in the very central chapter called The Origin. But the final word is probably not said yet. Therefore, I am happy to receive information that can clarify or contradict my version of the history of PP SLR cameras. And there may even be cameras that I have overlooked. There is a lot of knowledge out there. If you feel for it, please also push the Thumb Up under the pages you like. Note: Text and photos on these pages are protected under Norwegian law against any kind of copying and use without written permission. The Rectaflex of Italy - 1948. Marco Antonetto, Rectaflex - The Magic Reflex. To be found on the internet. I sent a return email to kundeservice , with photos. Did you receive them OK? I do not know how to send photos to you. Is this your email address: kundeservice@123hjemmeside.no, ? I cannot put the photos in this comment box. No, I didn't. Please try the given address. from Pentax.On the top Asahi in black and than Pentax in red. Collectors model or fake ? Never seen, never heard of. Most certainly done by some previous owner to personalize it. Well done! Thank you very much for this work! It helps me about lost Brands.